Despite the cold October Swiss breeze, the sun willfully pierced through every corner of this inferno masterpiece. At long last, I was standing in front of The Gates of Hell, all alive and cognizant of the reality it brings. You see, I didn’t die or hallucinate about agony. Hell is one of the very few places I would rather not add to my travel list, in this lifetime or the next. But then again, this sculptural masterpiece by French artist Auguste Rodin about The Gates of Hell breathes new life into the idea of underworld, pain, and redemption. Hell, no. Hell on earth, maybe worth a visit, because of this one. 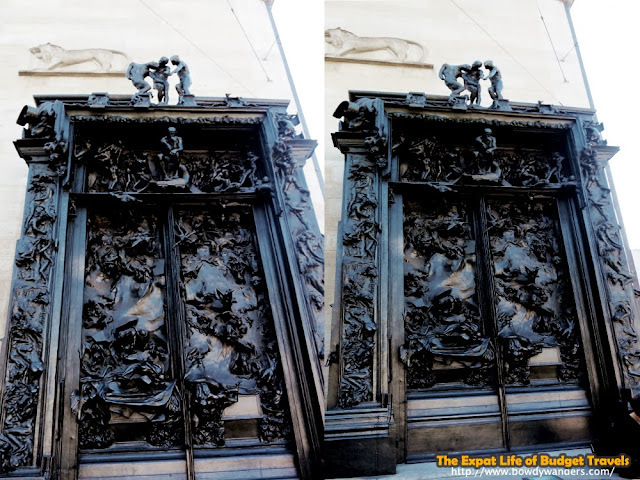 Although the original gate is in Musée d'Orsay in Paris, there are quite a few Gates of Hell scattered across everywhere. One in Philadelphia, another in Tokyo, one in Stanford University, another in Seoul, and the most iconic of all, the one in Kunsthaus, Zurich. The gate sculpture is beside the art house, no entrance fee and no opening hours needed. Best way to go is by tram or by foot, during weekday afternoons, when the sun is up, and the crowd is understated. The Gates of Hell stands out against the peaceful façade of the Kunsthaus, all dark and intriguing. Imagine on and off for 37 years, the inspiration and fruition of the Gates of Hell was one of the most controversial things during its time. Painstaking ordeal, yes. And because of this, you can clearly see the craft and imagination in every outstanding figure showed on the Gates of Hell. Seeing how the obscurely elaborate details are sculpted and meshed together, I couldn’t help but get gripped at the sight of all 180 figures. From Adam and Eve to the Thinker figures, all is mysterious --- mysterious enough to take you into a different kind of travel experience, one about wretchedness to history. Gives some truth and lenient understanding on what and how hell looks like. Growing up in a small town and being too sheltered on certain beliefs, I would think that these kinds of things are blasphemous. But then again, traveling changes everything in ways that I couldn’t have imagined was possible and the next thing I know, I’m standing in front of The Gates of Hell, admiring it, understanding it, and telling about it to everyone else. Truth is, everything is not made to be understood, but everything is made to be appreciated.